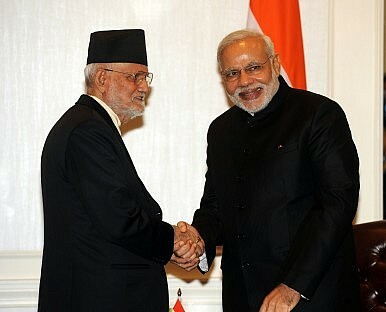 Narendra Modi meets Prime Minister Sushil Koirala of Nepal in New York on the sidelines of 69th session of the UNGA. India’s national interests will be served by speaking out on Nepal’s constitution-related violence. In the last two weeks alone, however, protests against the proposed document have resulted in 40 deaths—both of protesters and police. Much of the tension is in the Terai, along the Indian border, where many of Nepal’s minority communities reside, including most Nepali Muslims. Major protests by Madhesi and Tharu communities opposed to the proposed federalist mapping have become increasingly violent from lynching to burning people alive. The newly proposed 7 provinces would divide these communities, making them even smaller minorities in separate states. Unrest in the Terai has negative implications for India’s border security increasing the likelihood of spillovers of instability and terrorist attacks. India has an interest in postponing the constitutional process so the CA can ensure it is inclusive and durable. Nepal fought a long, costly civil war to secure representative government and civil liberties. After much struggle, freedom of religion, the press, assembly, and legislated gender and caste equality have become integral parts of a republican Nepal. India, as the world’s largest democracy and an example of functional pluralism at unparalleled levels of diversity, has a responsibility and vested interest in supporting Nepal’s constitutional journey towards a federalist republic. On a more practical level, India needs a stable Nepal. In general, crises and conflict episodes can generate destabilizing cross-border spillovers through migration, refugees, illicit trafficking, and contagion effects (of communal or class-based violence). Such events can also open up political space and unmonitored terrain within which extremist opportunists may operate unencumbered. Put simply, instability in Nepal heightens India’s vulnerability to non-state actor attacks. The porous Nepal-India border has well-served the purposes of those who would do India harm in the past, particularly terrorists coming from Pakistan or Kashmir. One of the two Lashkar operatives responsible for the attack at the India Institute of Science in Bangalore in December of 2005, Sabauddin Ahmed, fled to Nepal after the attack and played an important role in administering movement of operatives into India from Pakistan via Nepal. Two suspects from the 2006 Mumbai bombing along with a number of other LeT operatives and multiple Indian Mujahedeen commanders have been arrested on the border or in Nepal in the last decade. RAW operatives consistently coordinate with Nepali authorities in Kathmandu and Nepali forces on the border to track down and capture terrorists (to apprehend Zia-ur Rehman, for example). Thus India has a vested interest in shaping a CA process that results in a durable, stable outcome. Hindustan Times’ Nepal correspondent Prashant Jha has called for hands-on Indian involvement in the form of a “special envoy to Kathmandu” to help with domestic political negotiations. While India needs to play a role, such an invasive move would have a delegitimizing and destabilizing effect, ultimately undermining India’s goal of a strong, independent Nepali government. Instead, PM Modi should first publicly urge PM Koirala to heed the substantial unrest the proposed draft has caused and briefly delay passage in favour of more talks and broader input from a wider range of stakeholders. Modi should also leverage the considerable sway India has on the Madhes to urge protesters to cease violence against police and maintain the political process. As a former Indian ambassador to Nepal notes, passing the constitution without comprehensive support would break with a strong South Asian tradition of unanimous or near unanimous passage of constitutions by CAs. A durable constitution and Nepali state requires broad support. Second, Modi should reaffirm his support for a secular Nepal. It is in Indian security interests for Nepal to resist right wing calls from within the country and from India for Nepal to revert to a Hindu state in which everything from cow slaughter to conversion are not only socially but legally proscribed. The party seeking to resurrect the Hindu state is the royalist Rastriya Prajantra Party Nepal and their initiative was just overwhelmingly rejected by the CA. However, the impact of their disapprobation remains in the form of violent protests in the capitol and bombings of churches. Indian support of inflammatory Hindutva initiatives for a return to a Hindu state alienates minority groups broadly, including Muslims living on the border—the majority of whom have expressed a vested interest in Nepal being a secular state. Modi is no longer a BJP state minister and should overtly clarify that, regardless of his party affiliation, India’s foreign policy interests depend on a stable, secular Nepalese republic in which all religious communities are protected. Rushed passage of a constitution that excludes religious and ethnic minorities will weaken the Nepali state and further enflame the Terai. In periods of domestic unrest, Nepali forces are inevitably less focused on border management as they seek to maintain order within Nepal. The more unrest there is in Nepal, the simpler the task of non-state actors/terrorists infiltrating operatives and munitions from Pakistan and Kashmir to Indian cities. Groups like the Madhessi and Tharu continue their protests on the grounds that the current proposed federalist arrangement would undermine everything they fought for within the Maoist-led war. They are so determined to safeguard their representation in the constitution that they have taken to the streets despite repressive violence by Nepali authorities. Protesters have been gunned down in a few instances by the Army, which remains deployed in the Terai against the advice of Nepal’s Human Rights Commission. These groups feel betrayed by the Maoist leadership, and the Madhesi leadership has threatened to “teach [UCPN-M Chair Pushpa Kamal Dahal] a lesson” if their grievance is ignored. A rushed passing of a constitution with a federalist plan that fails to allow hard-fought representation for minority groups like these will delegitimize future governance of Nepal and possibly trigger a limited round of armed resistance. A representative, stable, and progressive Nepal is in India’s best interest. If unrest continues and the constitutional process stalls, collapses, or passes without first resolving widespread opposition, tensions may increase. India would find the task of guarding its borders against broad security challenges and specifically terror threats much more difficult in such a scenario. A critical method for staving off instability and bolstering border security is for India to champion a democratic, secular constitutional process in Nepal by encouraging delay in promulgation until unrest in the Terai has been addressed. This week is a key moment of opportunity for Indian leadership in a modern South Asia. Hannah E. Haegeland is a Herbert Scoville Jr. Peace Fellow at the Stimson Center in Washington, D.C.